I have erosion of my enamel on the inside of my teeth. What’s the best treatment for that? Loss of enamel on the insides of your teeth is usually caused by bulimia, otherwise known as binge-purge syndrome. There can be other causes of frequent vomiting or other sources of acid attack in your mouth, but in every case where I saw it, it was bulimia. The acid in vomit dissolves away the enamel, and this occurs mostly on the insides of the upper front teeth. The treatment would be all-porcelain crowns across the upper front and possibly in other places. Read a testimonial about a physician we treated who had bulimia. If you suffer from this, getting your teeth fixed can be a part of the healing process. If you’re ready to face up to your disorder, go to a cosmetic dentist, tell him or her of your problem, and this will help you rise above the self-loathing that you are probably experiencing. Dentists can also help patients toward recovery by lovingly confronting them. The loss of enamel on the inside surfaces of the upper front teeth is almost always a sign of bulimia, or there could be an acid reflux problem. Though acid reflux will generally soften the surfaces of all the teeth. Dentists who are trained to treat this understand the critical need for confidentiality. Here are photographs of the teeth of a patient suffering from bulimia. 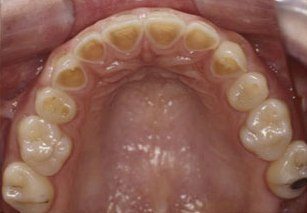 On the left, you can see the complete loss of enamel on the insides of the upper front teeth, and some enamel loss on the premolars. On the right, this is how the teeth look from the front. The incisal edges become very translucent – which creates a grayish appearance. The thinness of the teeth causes them to start to chip and thus become shorter. Someone asks about wedding cosmetic dentistry – how to get a new smile quickly, if time is a big issue. Direct tooth bonding is the answer, and Dr. Hall shows some photos of a wedding case and explains the advantages of this technique, and some cautions. Our dentist wants to use microabrasion to fix the white spots on my daughter’s front teeth. Is this a good idea? My dentist, who is also a prosthodontist, says my molar should have a silver filling or crown. I want a white filling. Is he right that a white filling won’t work well in this situation? I am told that porcelain crowns, including Procera and Empress, will eventually have a dark line at the gumline. Is this true?